MELVILLE, NEW YORK, July 17, 2013 - FONAR Corporation (NASDAQ-FONR), The Inventor of MR Scanning™, announced today that the company founder and president, Raymond V. Damadian, MD, presented at the “Premier Event for Practitioners” on July 9 at the Medserena Upright MRI Centre, which is located in the extremely affluent Kensington district of London. The grand opening for this Centre was May 28, 2013. FONAR had not previously announced the sale of this UPRIGHT® Multi-Position MRI Scanner. The Premier Event for Practitioners was well attended, with fascinating presentations about the inception and development of MRI technology and the innovation of the Upright MRI. These insights were delivered by world renowned MRI pioneers Professor Francis W. Smith, M.D. and Professor Raymond V. Damadian, M.D. After celebratory drinks and a buffet, guests toured the premises to see, many for the first time, the FONAR UPRIGHT® MRI. After an introduction from David Rose, of the Medserena Upright MRI Centre in London, Professor Smith, the Clinical Director, began the presentation with remarks about his involvement in the pioneering of the MRI industry. Professor Smith obtained his medical training at the University of Aberdeen in Scotland graduating in 1970. In 1980, he pioneered the clinical application of MRI, starting the world’s first clinical trial of MRI. In 1981, he began the world’s first diagnostic MRI service at the Aberdeen Royal Infirmary. Between 1980 and 1991 he worked in collaboration with a number of clinicians exploring the applications of MRI, being the first to show the potential of MRI to the examination of the abdomen and pelvis as well as for the study of pregnancy. During the past twelve years he has worked to develop its use for imaging the body in the Upright, weight-bearing position, demonstrating its value for the evaluation of the spine and weight bearing joints. He published the first clinical applications of MRI to musculoskeletal radiology, head and neck malignancy, liver and pancreatic disease, pelvic malignancy and pregnancy. He now has over 250 publications in peer reviewed journals, 32 book chapters and has co-authored 4 textbooks. He is a reviewer for both The Spine Journal and the European Spine Journal. In addition to being a Consultant Radiologist specializing in Musculoskeletal Radiology, he is also a qualified Sports Medicine Physician. He is currently, and has been since 1996, an examiner for the Diploma in Sport & Exercise Medicine of the IABSEM. As well as being one of two Club doctors for Dundee United Football Club, he has a Sports Medicine practice catering to all sportsmen and women. In this practice he combines his knowledge of sport and sports medicine with both ultrasound and MRI scanning. 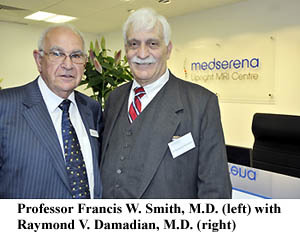 Dr. Damadian spoke about his historic achievements in MRI. In 1970, he proposed the original idea of scanning the human body by NMR (MRI) and discovered the NMR (MRI) signals that made it possible. He showed that the NMR (MRI) signal amplitudes of cancer tissue differ markedly from the NMR (MRI) signal amplitudes of the normal tissues because of the differences in their rate of decay (relaxation times). These signal amplitude differences enabled cancer tissues and other tissues to be visualized in MRI images because the signal differences generate the needed brightness differences (contrast) in the picture elements (pixels) needed to visualize detail in the MRI image. Dr. Damadian went on to build the first MRI scanner by hand, assisted by his two post-doctoral students, Michael Goldsmith and Lawrence Minkoff at New York’s Downstate Medical Center and achieved the first MRI scan of a healthy human body in 1977 and a human body with cancer in 1978. Fonar Corporation was founded in 1978. The study, as presented in “Brain Injury”, showed that the ‘fallen’ cerebellar tonsils (cerebellar tonsil ectopia (CTE) caused by motor vehicle whiplash injuries was being missed 60% of the time when the patient was scanned laying down in a conventional recumbent-only MRI. The study reported that the whiplash injuries were found when scanned upright in the FONAR UPRIGHT® Multi-Position™ MRI. As a result of this study, the medical evidence indicates that the ‘fallen’ cerebellar tonsils (CTE) of a whiplash injury patient can now be reliably demonstrated on medical images using the FONAR UPRIGHT® Multi-Position™ MRI. For more details, visit: www.fonar.com/news/072110.htm . Dr. Damadian, Professor Smith and six other distinguished speakers presented at Symposium 2013 on April 6, 2013 in New York City. The symposium was called “The Cranio-Cervical Syndrome (CCS): The Vulnerability of the Human Neck and Its Impact on Cerebrospinal Fluid (CSF) Flow.” There is a current pandemic of injuries of the head and neck resulting from the 1.2 million whiplash injuries each year in the United States. The principal purpose of Symposium 2013 was to bring to the knowledge of the medical community the existence of this Cranio-Cervical Syndrome pandemic that has been discovered in the course of doing Upright MRI examinations. The awareness of the existence of a Cranio-Cervical Syndrome (CCS), the vulnerability of the human neck, and its impact on cerebrospinal fluid (CSF) flow began with research and findings on multiple sclerosis. On September 20, 2011, Dr. Damadian and co-author, FONAR scientist David Chu, PhD., published a paper titled “The Possible Role of Cranio-Cervical Trauma and Abnormal CSF Hydrodynamics in the Genesis of Multiple Sclerosis," in the journal Physiological Chemistry and Physics and Medical NMR (Sept. 20, 2011, 41: 1-17), found at http://www.fonar.com/. It explained a new understanding of the role that cervical trauma and the obstruction of cerebrospinal fluid (CSF) is playing in the etiology of a neurodegenerative disease like multiple sclerosis and the likelihood that such CSF flow obstructions are playing an etiologic role in the genesis of other neurodegenerative diseases like Alzheimer’s. Dr. Damadian further pointed out the likelihood that cervical trauma and its resulting cervical obstructions of CSF flow are playing a significant role in the genesis of the other neurodegenerative diseases i.e. Parkinson’s, Amyotrophic Lateral Sclerosis (ALS) and childhood autism. In addition, he called attention to the likelihood that the neck injuries of professional athletes such as players in America’s National Football League (NFL) are playing a significant role in generating the subsequent impairments of mental function and dementia that these “contact sport” athletes are experiencing, secondary to the CCS generated by their neck injuries. Medserena Upright MRI Centre is fortunate to have such advanced medical equipment as the FONAR UPRIGHT® MRI. It is truly a unique technology producing exquisite images in all positions of the body and yields a whole new treasure of new medical applications. It is able to bring to the people of Great Britain the newest technology of making movies of the vital cerebrospinal fluid (CSF) as it flows in and out of the brain in the upright patient. This new technology is not currently available anywhere else in the UK and is of profound medical importance and immense benefit to the citizens of Great Britain. 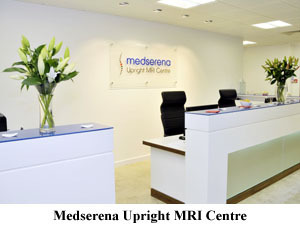 The Medserena Upright MRI Centre focuses on providing a superior patient experience in a newly established Centre in Kensington. 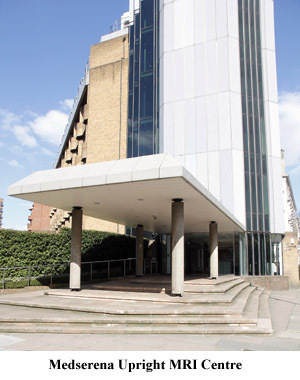 It is located at 114a Cromwell Road, Kensington, London SW7 4ES, U.K. The telephone number is 020 7370 6003 and their Web site is www.mri-london.com. The attractive Web site is very thoroughly done, and easy to navigate. 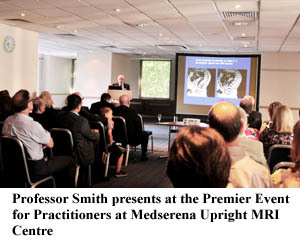 Practitioners and patients are encouraged to visit for a biography of Professor Smith, UPRIGHT® MRI case studies, a thorough list of scientific medical articles on UPRIGHT® Imaging and more.